Despite the lengthened feel of winter here in Northern California, you may still be feeling the urge to purge that comes with this change in season. Spring cleaning can be in the form of clearing out the house, your body and even mental habits that may be cluttering your life in order to create more space. Drink water! I’m at an age where I can tell how hydrated I am by the look of the skin on my hands. My aesthetician (Cherie Scalzi) always says, “be a grape, not a prune!” Water not only helps all of your functions function, it also clears out the stuff that isn’t needed and the easiest way to detox. There are many ways to calculate how much you should be drinking (depending on size, weight and activity level). 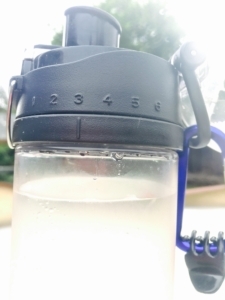 I like to aim for a gallon a day and keep track with this water bottle that has a nifty counter built into it! Breath Work – This could just as easily be placed in the mental cleansing category. Breath is HUGE at helping to release toxins, fat (yes, when fat burns up it turns into carbon dioxide and is released through exhaling – check it out), and negative emotions. It’s like a release valve for the stuff we should be letting go of, rather than cluttering our bodies with tension or stress. Full breaths engage our parasympathetic nervous system aiding in our rest and digest response. Try This (4-part breathing exercise): Inhale to a count of 4, hold the breath for a count of 4, exhale slowly to a count of 4, and keep the breath held out for a count of 4. Repeat for two minutes and increase the number as you exercise your lungs. This can be practiced anywhere… in bed at night, in traffic, at the office, etc. Get Your Greens – I just signed up for a weekly CSA (Community Supported Agriculture) through Soil Born Farms and am getting more produce than I know what to do with. Aside from salads and sautéing, I’m using greens in my morning smoothies and have created the best recipe! 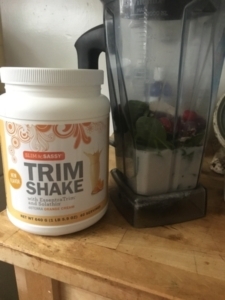 – dōTERRA Orange Cream Trimshake – the secret ingredient! A usual fan of their V-shake which is a flavor-less, vegan protein powder this company makes, I’m loving the new flavor of the Orange Cream (although it is whey based). Click here to grab your own. Smudge – This is a practice of burning a material (usually sage or palo santo) as a way to clear energy in your home. Practiced by Native Americans, science is now backing up some of the effects of the negative ions released and the effect on mood. When I smudge, I open up the space first (windows and doors) and then smudge myself creating an intention. Usually I take the burning wood or herbs throughout the house and send intentions into each of the rooms (may the kitchen be a place of healthy consumption, the bedroom a place of rest and love, my alter space a place of peace, the living room a space for communion and gathering, etc). Lemon Oil – This is a product that I will scream from the mountain tops as the worlds best cleanser! In fact, I’m furious it wasn’t taught to me sooner that this cheap and natural product could be so effective in cleaning and we’ve been tricked into purchasing toxic chemicals to clean our homes. 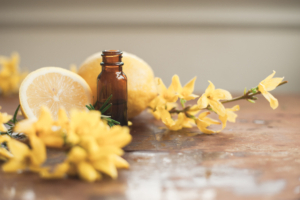 From glass to stainless steel to wood and mold, lemon oil is amazing at whatever you need. Sap stuck to your clothing or car… lemon oil! Shower spots and build up.. lemon oil! Wedgewood stove from the 40’s… lemon oil! 10-20 drops in a glass spray bottle (it’s so potent it will destroy plastic – so I’m serious with glass) with water (and maybe some vinegar) is all you need to clean just about everything. It’s non-toxic and with pure oils can be sprayed around food or even straight into your mouth! I have many back up bottles if you’re looking for a pure brand, contact me for 15ml @ $15 (that’s 250 drops). If you get the purest stuff it can be dropped into water and smoothies for internal cleansing as well. Chi Suckers – This is the term I use for people who drain you. The frequency of others can be fulfilling or a complete waste of time. Know how you feel around certain people and if it’s tired, frazzled or confused let them go. Not always easy, I get it, but life is too short to spend our vital force with those who are not equally exchanging it. Meditation – Along with breath work, meditation is the only way to clear thoughts. I know it’s intimidating but like anything, it gets easier the more you practice. Find a consistent spot, a comfortable pillow, and sit for a determined length of time – 5 minutes is a great start! Set a timer so you’re not checking a clock, watch or god-forbid your phone. Observe your breath and do your best to remain still despite the urge to move. Wait for it… with consistency it will happen and you’ll know when it does. It’s everything and nothing at once! What are you doing to Spring Clean this season?